Dell packed some of the best features from its more expensive business notebooks into a compact design that's built to survive daily use in the education market. Specifically built to withstand the abuses inherent to an education environment, this year's Dell Chromebook 11 features a solid build housed in a boring design. The Chromebook 11 ($249, £170, AU$320) looks more like a business laptop with its understated looks, but Dell claims its purpose-built design means that this notebook should survive drops, water spills, dirt and dust and most things that the harsh academic K-12 environment throws at it. Direct competitors in this rugged space include Acer's 11-inch Chromebook C740 ($249, £170, AU$320) and 15-inch Chromebook C910 ($299, £200, AU$385). 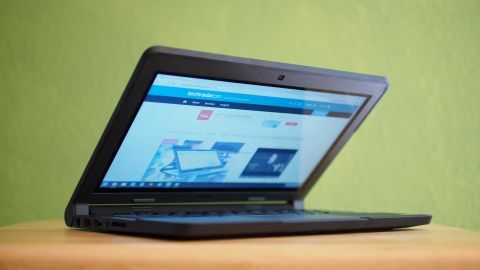 Dell's new Latitude 11 ($299, £194, AU$386), which swaps Chrome OS for Windows in a similar form factor, is also an excellent rugged candidate for the education segment. Those who don't need the rugged design and choose form over durability will find the Samsung Chromebook 2 ($249, £154, AU$282), Toshiba Chromebook ($279, £167, AU$309), and Lenovo N20p ($329, £210, AU$380) to be solid choices. The recently announced all-metal Asus Flip ($249, £167, AU$327) comes with a hybrid 360-degree hinge, allowing it to transform into various form factors, including use as a tablet. Home users who may not have budget constraints can find more powerful systems elsewhere. The 11-inch MacBook Air ($899, £605, AU$1,155) is a compelling choice given its small footprint, solid aluminum construction, and portability. Apple bundles its free productivity software with OS X, and unlike Chrome OS, the Air can be used as a regular notebook without requiring a constant tether to the internet. Unlike Asus, which is trying to reinvent the Chromebook category with its 360-degree hinge on the Flip, Dell is taking a more measured approach in creating a durable product that will survive daily student use and abuse. Because of the rugged construction, Dell's Chromebook 11 ends up slightly larger and heavier than the competition. Compared to Toshiba's Chromebook 2, a device with a larger 13.3-inch panel that measures 12.6 x 8.4 x 0.76 inches (32.0 x 21.3 x 1.9cm), the Chromebook 11 occupies almost the same footprint at 11.69 x 8.57 x 0.83 inches (29.7 x 21.8 x 2.1cm). Acer's C740 with a similar 11.6-inch display is slightly more compact than the Dell model at 11.3 x 8 x 0.79 inches (28.7 x 20.3 x 2.0cm). With a touchscreen, the 2.91-pound (1.32kg) Dell Chromebook 11 is heavier than the Acer C740's 2.87-pound (1.30kg) weight. Without a touchscreen, Dell's model is only 2.74 pounds (1.24kg). The Chromebook 11's weight is about on par with the 11-inch category, and is still light enough for students to carry around all day. What sets the Dell Chromebook 11 apart from others on the market is its rugged design. Dell claims that its new Chromebook 11 passes US Military Standard testing for durability, dirt, dust, pressure, temperature, humidity, shock and vibration "so it can handle student life." To meet those durability claims, Dell cloaks its Chromebook 11 in a solid, matte black plastic case, a design choice that hides scratches, dirt and fingerprints well. A rubber bumper along the edges of the Chromebook 11 helps shield the notebook in case it's dropped. Acer's education-centric Chromebook offerings come with reinforced hinge designs and strengthened corners, but lack the full rubber bumpers and the sealed keyboard and trackpad of the Dell Chromebook 11. On the Chromebook 11, the touchscreen is an optional upgrade, and it allows students another means to interact with the content on their Chromebook beyond the keyboard and trackpad. Another feature that sets the Chromebook 11 apart from the competition is the reinforced barrel hinge. Not only does the barrel hinge allow the lid to be opened up to 180 degrees for better peer-to-peer collaboration, Dell says that it is also extremely sturdy. As students would often grab and carry the Chromebook by the lid, the barrel design helps to reduce stress and prevent the hinge from breaking. The hinge also houses loud, forward-firing stereo speakers. The non-backlit keyboard is surprisingly pleasant to use. With almost full-size keys - the keys are about 1/16 inches more narrow than the keys on a 15-inch MacBook Pro - typing is comfortable. The keys are extremely springy, but lack the key travel of a full-size laptop keyboard. There is a dedicated row of standard Chrome shortcut keys on top of the keyboard. The trackpad on the Chromebook 11 is extremely responsive, and I found cursor tracking to be accurate. In addition to the reinforced barrel hinge, the Chromebook 11 comes with a waterproof keyboard and trackpad - features that are typically found on more expensive business laptops, like the Lenovo ThinkPad T450s ($881, £591, AU$1,131). The waterproof keyboard means that the Chromebook 11 can be used in science labs and other hazardous education environments. For those opting for a touchscreen model, the Corning Gorilla Glass NBT screen helps to protect the display from scratches.